It’s easy to hear the relationship between these two songs. The similarities are, however, limited and superficial, residing in just three measures (12 beats or about 9 seconds) of chords that are generated from a chromatic bass line that is found in both songs. This is not, however, the only song that utilizes this progression. Jim Croce’s big hit “Time In A Bottle” uses the same chord progression and was released in 1972. Unlike the other pieces that are in 4/4 time, this piece is in 3/4. The Eagles’ smash hit Hotel California uses the same progression, and was released a few years later in 1976. That’s three songs, all of them huge commercial successes, in three different genres, and all released within a few years of each other. That may lead us to conclude that this chord progression is somehow “era specific,” but it is not. Chet Baker’s recording of “My Funny Valentine” features the same chord progression. Baker, however, did not write the tune. It was written in 1937 by Rodgers and Hart and recorded by Baker in 1956. It was also recorded by hundreds of other musicians including Miles Davis, Bill Evans, Ella Fitzgerald, Elvis Costello and many others. A famous latin composer, Antonia Carlos Jobim, composer of “The Girl from Ipanema,” used the same progression in his song “How Insensitive” which was recorded in 1967 by Frank Sinatra. The works referenced so far are all quite famous which might lead us to believe that this chord progression is a recipe for commercial and artistic success, but alas, it is not. There are other examples that did not result in commercial success, of which Spirit’s “Taurus” is but one. For example, Jethro Tull’s “We Used To Know” uses the same progression. It was released in 1969 on the band’s “Stand Up” album. Ian Anderson, the group’s leader, apparently without realizing that others had utilized this chord progression long before he did, actually talks about the chord progression as being the basis for “Hotel California”! Another example from a more contemporary band is “Crucified” by Ghost B.C., which is not their tune, it is a cover of the song by Army of Lovers from 1991. There are also many songs that use most of this chord progression, but not all of it. One of the most popular variations omits the second pitch (G#) and moves from A-G-F#-F-natural. This is found in “While My Guitar Gently Weeps” and “Dear Prudence” (the first version in my list that is in a major key–the others are in minor keys) by the Beatles, both released in 1968 on The White Album, “25 or 6 to 4” by Chicago, released on their second album in 1970, and “Babe, I’m Gonna Leave You” from Led Zeppelin’s debut recording in 1969. The latter song, interestingly, was not written by Led Zeppelin, it was written by Anne Bredon in the late 1950s and was also recorded by Joan Baez in 1963. There are also countless songs that use yet a further truncated version of this progression. In this version, both G# and F# are gone, and the progression moves from A minor-G-F. This is found in Ray Charles’ “Hit the Road Jack” and, surprisingly enough, it is the progression found at the end of Stairway to Heaven in the anthemic chorus when Plant sings “and as we wind on down the road.” This more simplified version is found in so many songs in so many genres—rock, pop, soul, motown, disco, country, etc.— that if one were to remove it from the entire collection from 1960 through today, the result would look like a 50-year old picket fence in a state of disrepair and neglect—huge gaps throughout, and some songs missing entirely (like Ray Charles’ “Hit the Road Jack”). What do all of these songs, some famous, some not, have in common? Certainly they share the same chord progression, and although there are variances in tempo, meter, instrumentation, drum patterns, and other elements, the defining element is found in the melody and the lyrics. 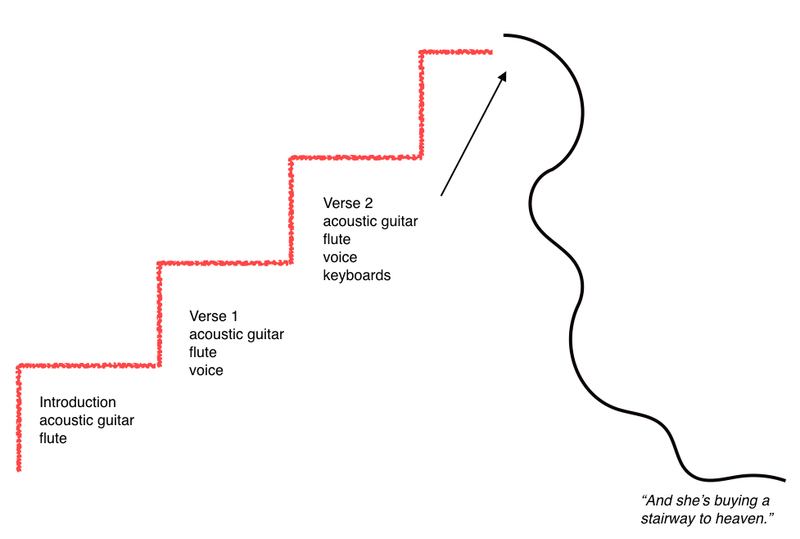 “Stairway to Heaven” begins with a memorable melody in the guitar, which everyone recognizes, and continues with a series of verses, interludes, and that powerhouse third section that ends the piece. These melodies and the chords that accompany them change ever so slightly throughout, providing a continuous but subtle variation on what is presented in the introduction and the first verse of the tune. None of this happens in “Taurus”–there is no memorable melody to be found. The piece opens with a meandering attempt at being “symphonic” but lacks any real melodic or harmonic direction. That section is then followed, without rhyme or reason, with the chord progression in question, and even that progression falls short of the mark because the phrase is not concluded in a very satisfying manner. “Stairway to Heaven,” on the other hand, is one continuous and meticulously constructed and executed “build” to the end. Lyrically, “Stairway to Heaven” is poetic and evocative, telling a melancholic story of the futility, hubris perhaps, of the Lady who is trying to attain salvation and contentment through materialism (at least that is my interpretation, and I am sure there are others equally as satisfying!). Yet, it also contains hopeful elements–there are, after all “two paths” that we can go on, and there is “always time to change the road you’re on.” Throughout their early years, Led Zeppelin overtly referred to the “Lord of the Rings” trilogy in some of their songs, and in this one, though perhaps not directly linked, we sense a deeper mythology at play–this is not party music, this is an attempt to convey a deeper message and it seems that the attempt was extremely successful in that successive generations have embraced the song and the band that their parents and grandparents first listened to many decades ago. At the end of the song, as it appears that the Lady has attained her goal, the music begins to fall apart rhythmically, signaling a metaphorical fall or stumble, and the edifice collapses; the Lady plummets back to earth, alone and destitute as portrayed by a short reprieve of the verse, a final, plaintive cry, a cry of warning perhaps, that salvation or satisfaction cannot, in the end, be purchased. “Stairway to Heaven” endures as a masterpiece of songwriting whose many qualities have absolutely nothing in common with Spirit’s “Taurus,” except for nine seconds of a common chord progression that they share (along with dozens of other songs). Copyright law has generally sided with the idea that it is melody that is the unique part of any song, and this analysis strongly supports that position. 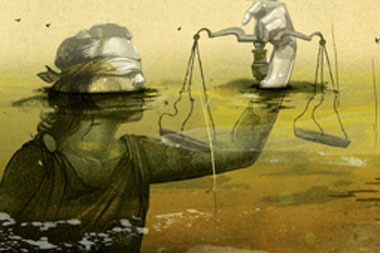 If the courts decide otherwise, it will be a free-for-all of frivolous lawsuits, a veritable “open season” on the most successful groups of the last 50 years. Hopefully common sense will prevail, because in this case, the Spirit is willing, but the evidence is weak, very, very weak. That is why the lawsuit should crash like, well, like a lead zeppelin. The use of line cliches is wide-spread in music. Led Zep is well-known for their “appropriation” of material, but in this case it’s hard to find the back or front of the line. I found Ian Anderson’s comments to be refreshing, even though they were a little odd given the ubiquity of this type of “omnibus” bass/chord movement. There’s a lot of this in every style–jazz included of course, so this litigiousness is truly unfounded. What’s unique and memorable is never the picture frame or the canvass, it’s the picture and the subject therein contained! I just noticed that spellchecker made some interesting changes to my post. I kind of like them, but do not remember for the life of me what I originaly intended. Given we are essentially talking about folk music we shouldn’t get too excited about the use of such conventions; they are familiar and often easy to play for beginners.